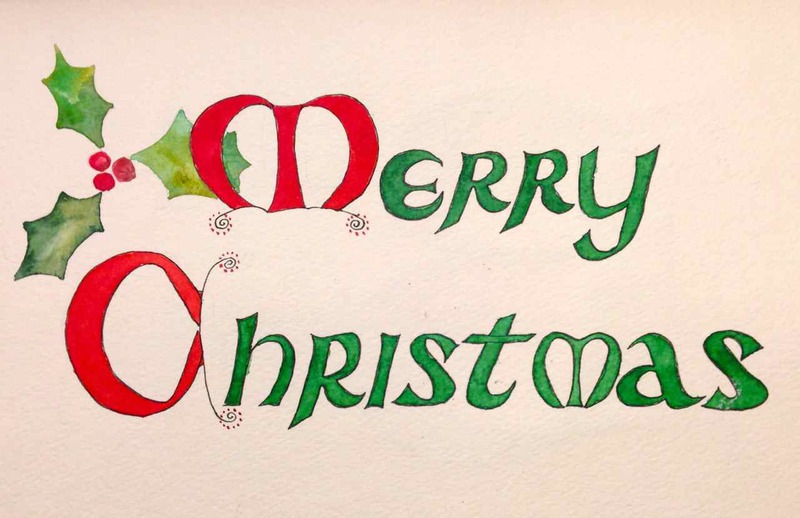 All the holiday hoopla really cut into my sketching time and now the deadline looms. Wednesday, January 15th, 2014. There’s still lots to do on my project but things are… as they say… progressing. Whoever “they” are. Atlas of… that’s my theme. 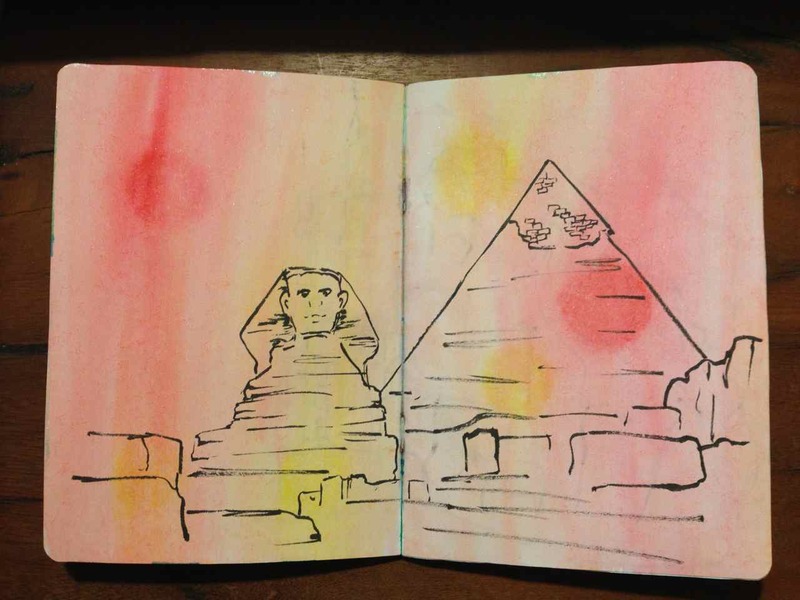 I originally had painted all the page spreads in my book so now I’m filling the book with line drawings of well-known landmarks of the world. I love the irregular lines my PPBP, Pentel Pocket Brush Pen, makes on the pages… the india ink seems to fade to a charcoal gray. It’s organic and subdued… not jarring. I see this book as a travelog you can hold in the palm of your hand as I take you east around the globe visiting my vacation wish list! I pre-painted these pages before I even thought of my theme. Now, I’m thinking serendipity is my friend. I think the colors work well with the sketch locations. I like how I have the gold streaming through the Eiffel Tower and especially the pinky-gold… it gives the Sphinx the feel of the desert sun. Hmmmmmm… 2 continents so far. Will I manage to visit them all? The last few years I’ve participated in Roz Stendahl’s IFJM… International Fake Journal Month for the uninitiated. It’s a chance for journal keepers to put on a different persona and journal as if you really were this individual. Not forever, just a month… the month of April. Just long enough to get a feel for the difference between this character and yourself. It’s a chance to be the person you always wanted to be or a chance to try out that career path you were fascinated with but never took for one reason or another. 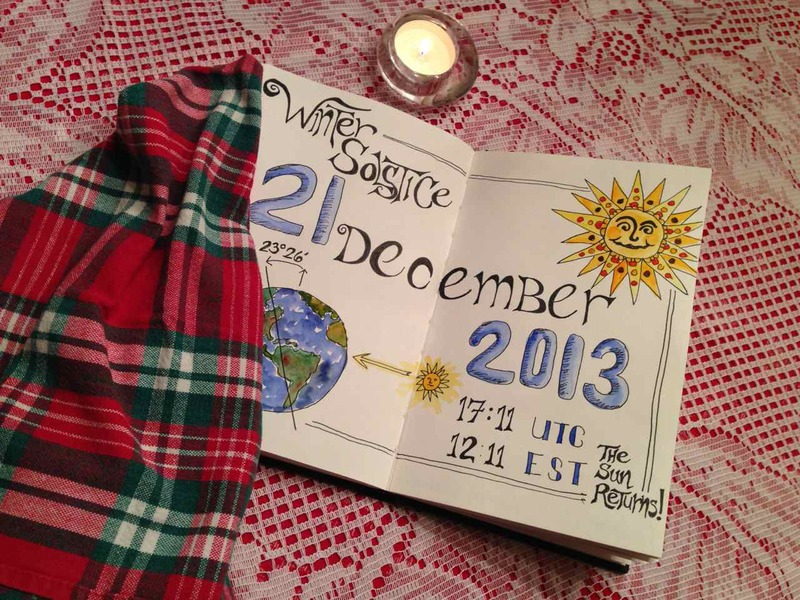 It’s possible for a Fake journal to be totally written but I’ve chosen to create visual journals. In the past I’ve uploaded my pages to a Flickr account but have found that problematic so I’ve created a new blog to hold both my previous years efforts and my fake journals going forward. I’ve already started uploading my 2012 journal and will follow with 2013 before I start in on the planning for this year’s journal. For those of you who have seen this before please bear with me as I go though my retrospective. My intention is to be current by March when I’ll start planning the 2014 experience. If you’re interested in IFJM as a concept please visit Roz Stendahl’s Official International Fake Journal Blog. 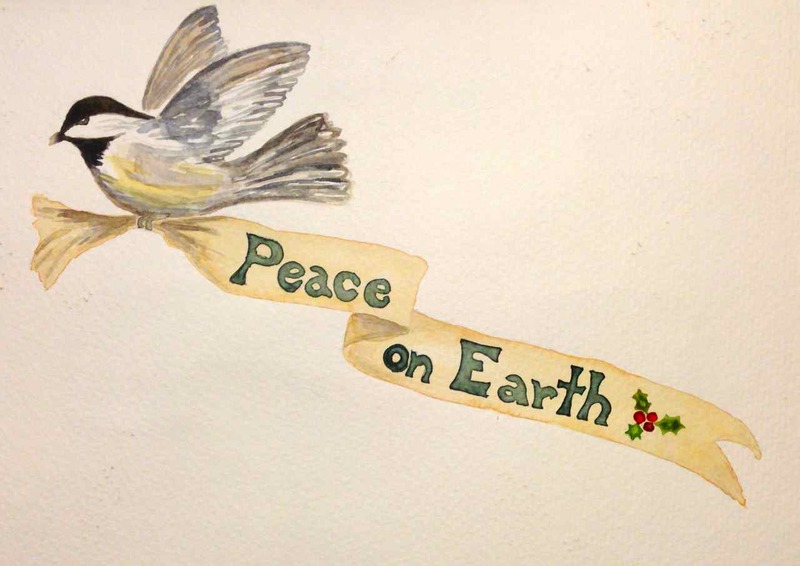 If you’re interested in learning more about Roz and her art please check out Roz Wound Up. As if one blog wasn’t enough! The final remnants of our small solstice celebration… table’s cleared… dishes washed… only embers in the fireplace now. Let’s all rejoice at the return of the light! Can you say impulse buy? As I was in line to pay for my holiday shopping my eye was caught by a cute little lime green box. 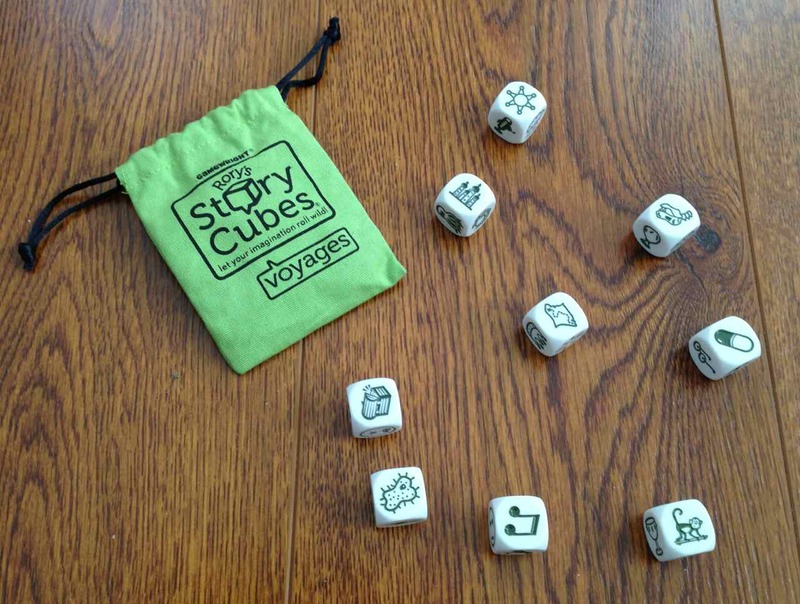 Rory’s Story Cubes – Voyages. I’m always looking for inspiration ideas and these images really appealed to me. On sale too… I couldn’t go wrong! Now I’ve always been drawn to dice even though I’m not a gambler. I love the feel of them rolling in my palms. Nine dice… no dots… instead there are pictures, or should we call them icons? This is a game for everyone age 8 and up. That’s me! The instructions are to roll the dice and then make up a story on the spot with the inspiration from the images. Once upon a time Bess lived in a downtown high-rise in the city. One afternoon she felt feverish. Her forehead was hot, hot as the sun, and her belly wasn’t right either. Off she went to the emergency room where she was diagnosed with an amoebic infection to be treated with a high-dose prescription. Once home she slept, exhausted from her day. She dreamt she stood in the forest hearing faint cries. What is it? The sounds lured her into a clearing. There she found a treasure chest and, uncaring of Pandora’s lesson, she immediately opened it. Out jumped a monkey making the loudest ruckus. He was screaming and screeching and was holding a scroll. Bess leapt and wrestled the scroll from him. As she looked closer she saw it was a map to ancient archaeological dinosaur burial sites. Bess thought, “Wait, a treasure map? That only happens in dreams.”, and promptly woke up. But, I’m not always going to make up a story. I plan on using these one or two at a time as journal prompts. Maybe I’ll create a page about my interest in western North American dinosaurs or one about moving to the country after growing up in the “Big City”. With 9 cubes that’s 54 images… and there are two more sets: Original and Actions. 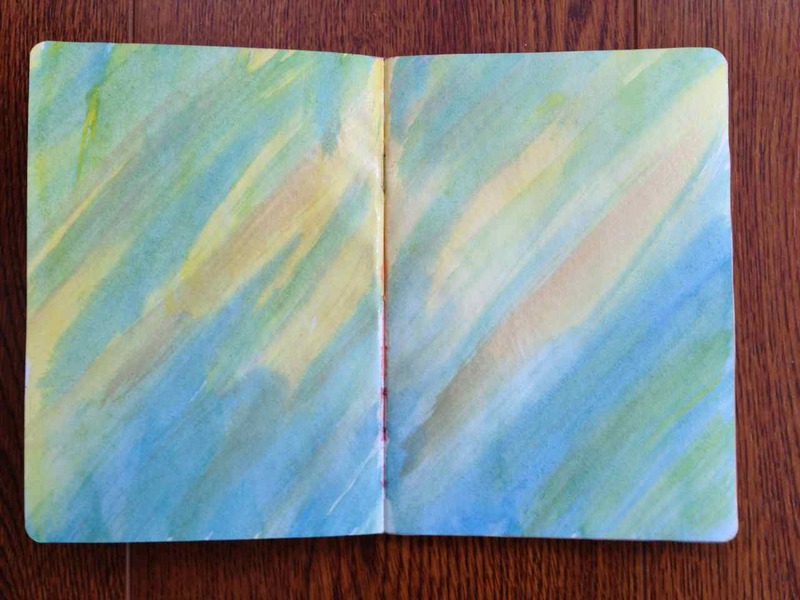 I had all sorts of great ideas of how I was going to fill my Sketchbook Project with all sorts of splashy watercolor… that is, until it arrived. It has the absolutely thinnest paper I’ve ever worked on! But I one of my goals was to use the sketchbook as-is. No adaptations. 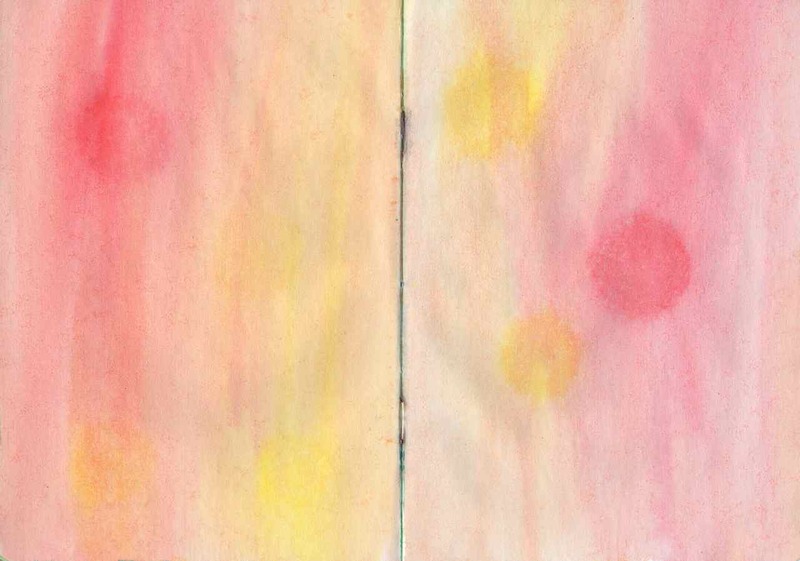 I thought of using colored pencils but I really wanted full backgrounds full of vibrant pigments. 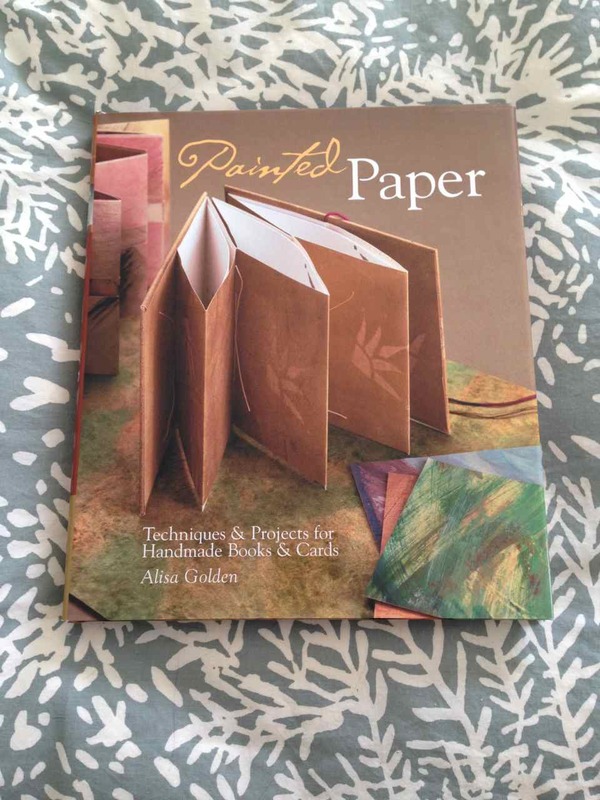 I recently read Alisa Golden’s book from a few years ago, Painted Paper, where she promotes the use of acrylic ink dry-brushed across the pages. Acrylic ink, NOT acrylic paint. It doesn’t leave a plastic feel to the paper so the pages won’t stick even in humid weather and she claims it will be easier to write on. Brilliant! Well, believe me, even the driest dry-brush completely warped the paper. Ah-ha! I’ll iron it flat! Amazingly, it worked. I tried different techniques on each spread. 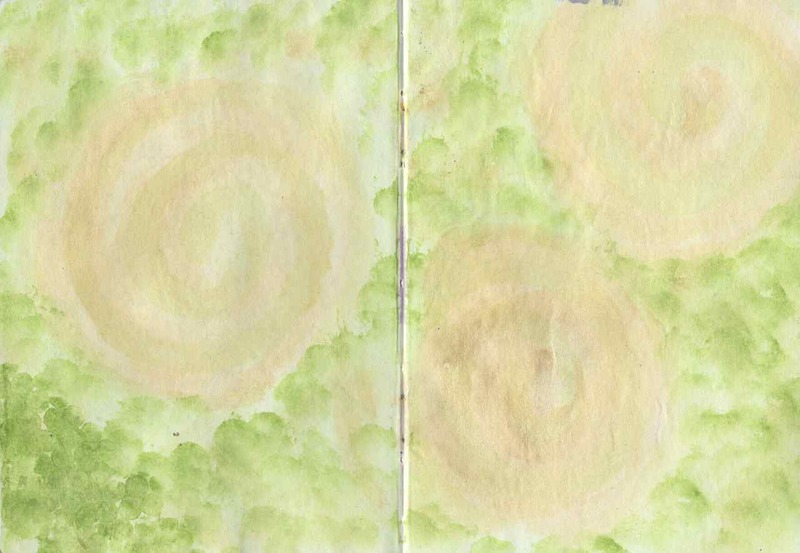 Some I brushed, some were stamped; I even hand cut a stencil from a cereal box and spritzed diluted ink onto the page. Each time I ironed the pages dry and flat… ish. They make a wonderful crinkly sound when turned. Now I have a book filled with vibrant color. Just what I wanted. Hmmm… now to fill the book! I’m going to pour myself a cup of peppermint tea and get to work. These are the 2014 Official Themes: Strange Neighbors / Borders and lines / A simple place / Accidents / Found! / Dudes and latitudes / To the last page! / First aid kit / Say words out loud / Paper airplanes / This list… / Atlas of… / Greetings from… / 32 Days / This is not about you / This is not about me. I’m thinking an atlas of……. Well it won’t be all writing. I’m here to share my interests and pursuits which often border on obsessions. I’ve been like this all my life. As a girl scout I earned all sorts of badges. Never content learning one thing well, I’ve always been a artsy-crafty dabbler. I’ve sewn clothing and I’ve embroidered and done needlepoint. I crochet and knit… not particularly well, mind you. I quilt. 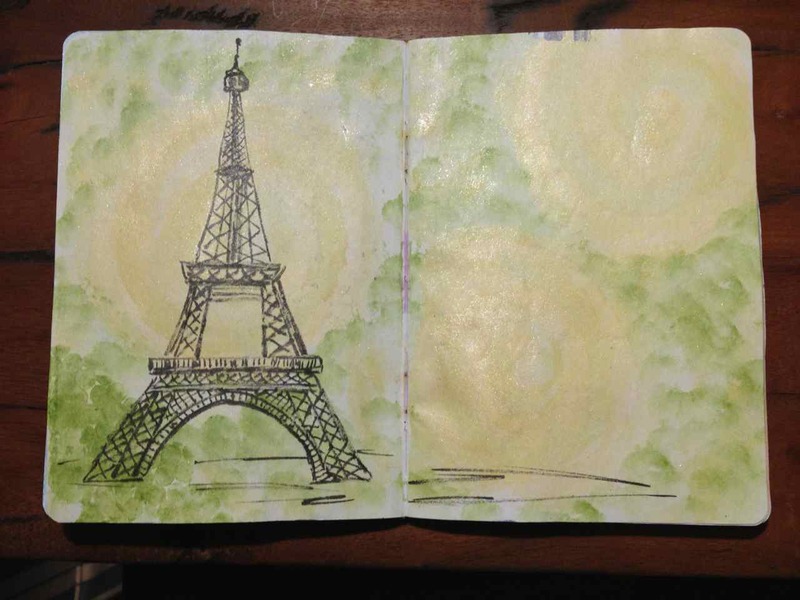 My latest passions are sketching, watercolors and journaling, preferably all at the same time, in the same sketchbook. 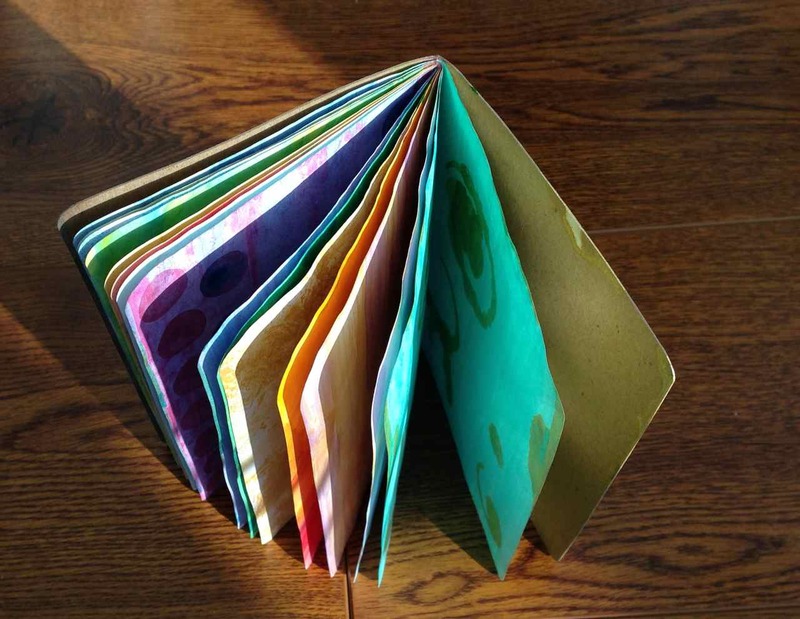 I’ve even started bookbinding so I can use the paper I like in the size I want. Don’t believe me? Well, that’s what the blog’s for. I want to share my fun… let’s go! This is my workspace and yes, I cleaned so it would be more photogenic. Most everything I need is close at hand… sketchbooks, sewing machine, bone folders and PVA, good lighting and a comfortable chair. There’s plenty of inspiration from my friends hanging on the wall. I even have two large windows with views to the backyard. But… I can’t get distracted. I have a deadline looming. 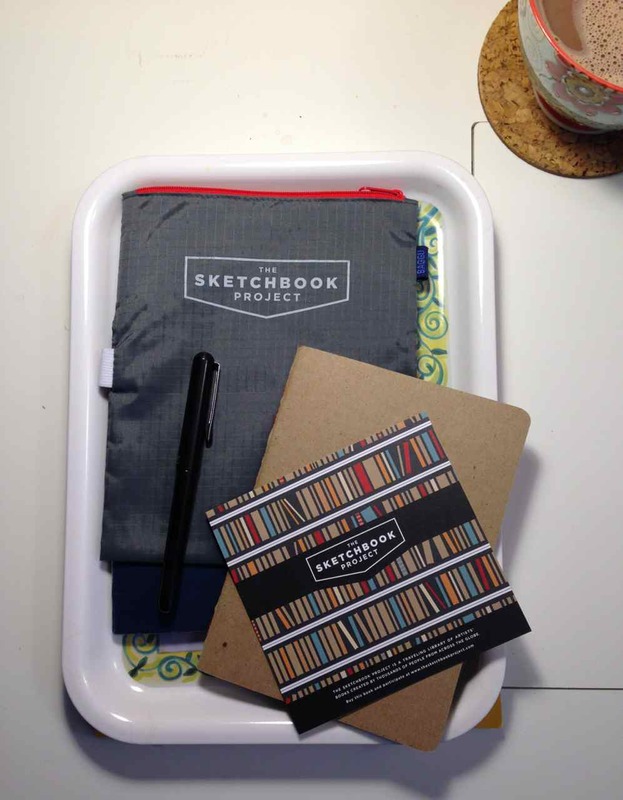 I’m participating in The Sketchbook Project and the book needs to be postmarked by January 15th, 2014. Aauugh! Just over a month to fill a 32 page book. I’ve got to get crackin’. 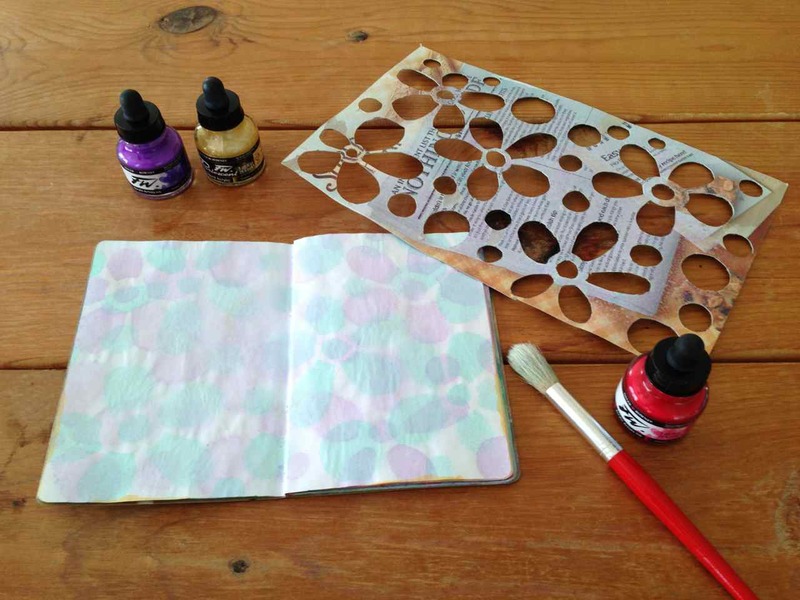 Next post we’ll see how I’ve prepped the pages.